Seattle’s Tilted Thunder Rail Birds flew down to San Diego to battle the Wildfires on Saturday, February 7th. The red and purple underdogs took to the track Friday night for a last-minute practice and showed up Saturday prepared to take on the San Diego All-Stars. The first few jams looked promising for the Rail Birds as they commanded the lead. Eventually, the Wildfires gained back the lead…and kept it. The strong Wildfire defense, including Tsunami, Slamurai, Ballistic Bomber and Psycho Brahe, consistently shut down the Rail Birds. Seattle’s strongest jammers Shadow Breaker, Mae Lay and Creep Suzette were, unfortunately no match for San Diego’s aggressive blocking. 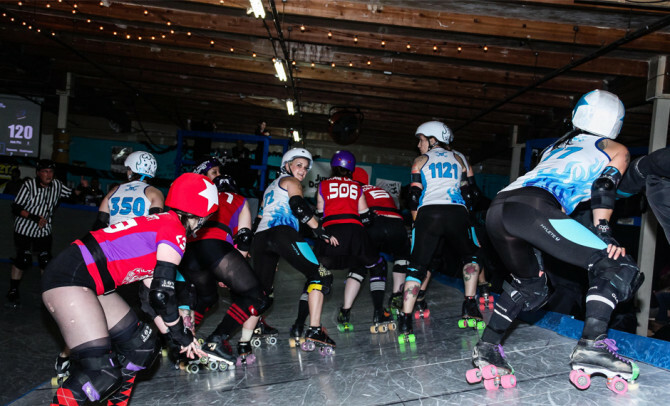 The depth and skill of the Wildfire jammers, including Boo LaLa, Brazen Bull, Hartlyn!, Kung Pow Tina, and Nova, were simply too much for the Rail Bird blockers. In the end, though, penalties doomed the Rail Birds by leaving them only seven players at the end of the game. San Diego won with a score of 247-76. Post-game awards were given to each team. Best Blocker was given to San Diego’s Kupcake Kaboom and Seattle’s Slammi Sweetheart. San Diego’s Kung Pow Tina and Seattle’s Shadow Breaker were Best Jammers. And overall MVP went to San Diego’s Boo LaLa and Seattle’s Creep Suzette. The Wildfire’s next away game will be against the Orange County Roller Girls Psycho Ex-Girlfriends on Saturday, February 21st at 7:00 pm in Santa Ana, CA. Their next home game will be on Saturday, March 21st at 7:30 pm against the Los Angeles Derby Dolls Varsity Brawlers.